Pre-event planning: "This annual sales kickoff is intended to motivate and energise staff for the sales year ahead," explains S&P Capital IQ executive assistant Joy Eaton-Boyd. The client had a previous relationship with agency Conference Contacts so arranged a meeting with its operations director, Rosalyn Giles, to deliver the conference brief, which specified a warm location, ideally near the sea, and not too far from the airport. Challenges: "I had to change the client's perception of Tenerife solely as a holiday destination," reveals Giles. "I was able to convince them that, out of all the Canary Islands, Tenerife is the most geared towards conference travel, in terms of its hotels and infrastructure." The client insisted on a maximum of ten delegates flying on the same plane, so the low-cost airlines such as Easyjet, Monarch, and Ryanair were ideal. Local DMC Ten Travel supported with transfers and helped with AV, which included a video link with the US office. A further complication was that one of the airlines, Spanair, went out of business. Solution: The first day comprised an informal dinner as clients were arriving at different times before the conference and regional meetings the following day. The third day centred on the President's Circle Awards, which recognise achievement in sales, customer support and inter-team working. This included a dinner, held around the swimming pool, and as the Abama is in the north of the island, heaters were needed. The entertainment of a local modern flamenco troupe also helped to warm up delegates. The eight delegates affected by Spanair's closure were offered an extended stay in the hotel along with rearranged flights. 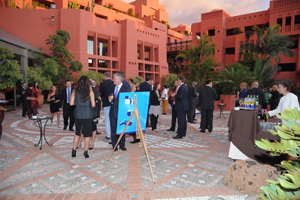 Post-event analysis: Eaton-Boyd enthuses about the experience: "The Ritz Carlton Abama provided unparallelled service. I would recommend this hotel to anyone wanting to impress delegates."